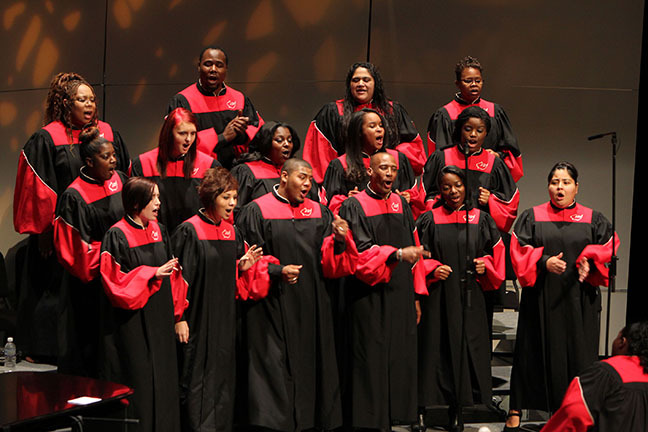 The sixth annual “Lift Every Voice: Celebrating the African American Spirit” concert will be held at the Northside Hall Campus Auditorium at 7:30 p.m. Saturday, Feb. 22. The South Bend Symphonic Choir and IU South Bend Gospel Choir will be performing with special guests Rodney Mack on trumpet, Maria Corley on piano and Denise Murchison singing soprano. Beyond that noteworthy lineup, the concert will feature a first. A piece composed by IUSB junior Julius Miller, “Set Me as a Seal,” will be performed by Miller and his peers. Miller wrote and performed his compositions before when he sang in The United Voices of Detroit, a choir from his hometown. But according to Miller, this will be the first time that a piece written by a student will be featured in this concert series. Miller will be in good musical company. This year’s headliner is an accomplished trumpeter from New Orleans. Rodney Mack is the leader of The Rodney Mack Philadelphia Big Brass band, and also plays with the Chamber Orchestra of Philadelphia. According to an IUSB press release, Mack will host a master class free of charge at 3:30 p.m. Friday, Feb. 21, in the Education and Arts Building room 1103. Tickets for the concert can be purchased at the Northside box office for $3.00. Admission is free for students and children.